Hi Girls! If you read my Feel Unique Haul post here, you will know that I recently picked up Benefit Erase Paste. I bought it with some of my birthday money after umming and ahhing over whether or not I should buy it for quite some time. Now I'm sure you have all heard of this product before as it has been highly hyped all over the blogging scene for a while now with a very mixed bag of reviews. It has always stood out to me as one of those cult beauty products that people either love or hate and something I just had to try for myself. To be honest, I don't suffer badly with dark circles or bags. Yes, I have them as much as any other person but it isn't something that has caused me too many problems. With this being said, concealer is one of the beauty products I have never really bothered with. I have tried a couple from MAC that have been average and more recently the infamous Collection 2000Lasting Perfection concealer which I absolutely hated. (Ooh, controversial!). After trying said concealers and not seeing any improvements to the overal appearance of my makeup, I stopped using them and just stuck to foundation. However, recently I felt like something was missing from my makeup and decided I needed something to brighten my under eye area. I've always loved that Kim Kardashian bright eyed look so I began my quest of finding the perfect under eye concealer. As I said, this product has received mixed reviews but after reading the good ones and seeing various before and after photos, it seemed like everything I would need from a concealer and more. So, what did I think when I received it in the post? On first impressions, I loved the packaging. The box this product comes in is so beautiful and quirky like all Benefit products and the fact it came with a lesson book and spatula was a nice added touch. However, what I did notice is how teeny tiny the actual jar of concealer was. This product cost me £19.50 so I was quite alarmed to see a tiny pot staring back at me. Nevertheless, I was excited to try it and set about popping it under my eyes. The instructions on the box direct that it should be applied with the spatula included but I have to say it is a silly invention and I wouldn't waste your time. It creates large dints in the product and picks up way more than is needed. Sorry spatula, you are pants! Instead, I dab my finger lightly on the surface and then apply it in dots under my eyes, mainly concentrating on the inner corners. The first thing I noticed upon application was the salmon toned colour and creamy consistency. 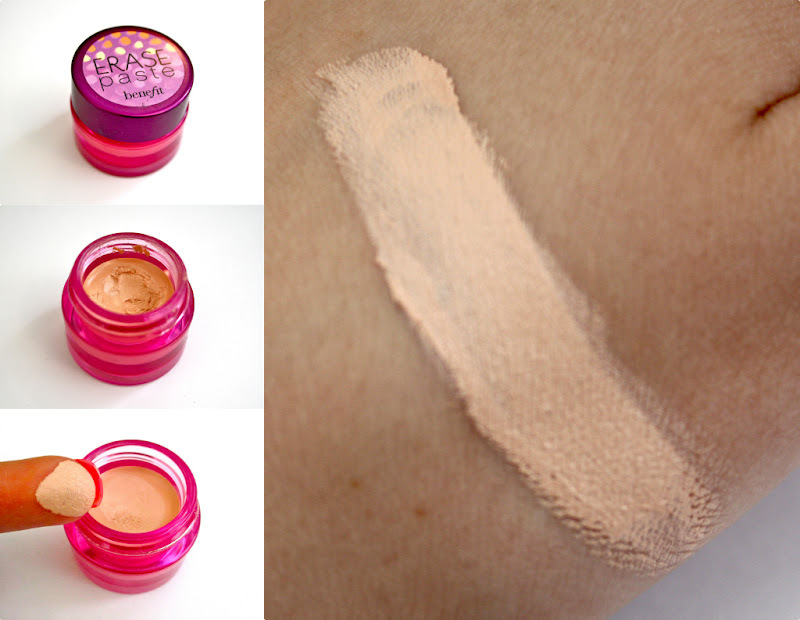 As you can see from the swatch above, there is an evident salmon tone to this product which is known to cancel out dark circles. As for the texture, it is amazingly smooth and blends into the skin like a dream. As well as being very creamy, it is relatively thick meaning the tiniest bit goes a long way. I didn't find that it caked under my eyes but I imagine it could if too much was applied, much like any product. It didn't settle into any fine lines and it instantly made my under eye area look brighter. As you can see from my before and after pictures above, it has taken away most of the darkness from under my eye and looks very natural. Just for reference, apart from the concealer I had no makeup on in the above pictures so the coverage is even better with foundation as well. The only slight criticism I would give this product is that I find it needs to be set with a powder or it begins to look oily and shiny. This wasn't a huge issue for me though as I always set my foundation with a powder anyway. Overall, this is the best concealer I have ever tried. Apart from the price tag, I have no complaints about this product. As I said above, I was alarmed to see such a small pot but since using it I have realised that it will last months due to only needing a tiny amount each time. I would highly recommend this product if you suffer with dark circles and want something to cover and brighten without looking thick or cakey. On a side note, I would like to thank each and every one of you who read/commented or tweeted about my dealing with OCD post. I was really overwhelmed by all the nice comments and am so glad I plucked up the courage to write about it. I would also like to give a lovely young lady named Felicity a mention for providing me with a beautiful new blog design. I emailed her after being impressed by some of her other work and within minutes she got back to me and set to work on customising my design. She was so helpful and efficient throughout the whole process and really took into account everything I said I wanted and more. I am over the moon with the new look of my blog and can finally stop winging to my boyfriend about not liking this or that - I'm such a perfectionist! So thank you very much Felicity and if any of you fancy a spruce up be sure to drop her an email at felicitynielsen.89@gmail.com. (She didn't ask me to write this by the way, just so you know). Sorry for this mammoth post, I realise I'm a chatterbox! Have any of you tried Erase Paste? Do you love it as much as me? 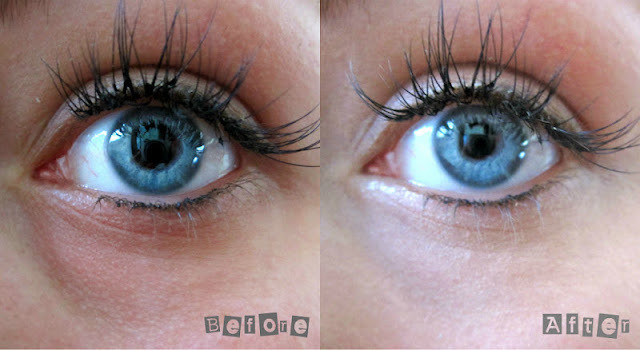 Wow, are these your natural eyelashes!? If they are, I'm mega jealous! I tried BeneFit's Boi-ing concealer and I was really impressed by it, a I might give this one a try too! I really want some of this, I've never found a really good concealer, and this looks really good! Your before and after pictures look great! I am a huge Benefit fan and I still have never tried this. I'm sold though based on your pictures! Thanks for posting!! I've used this before and though I do really like it, I found that it got a bit odd by the end of the day - like it settles oddly after a few hours. I still use it on occasion but mostly for events that I know are only a few hours, unlike work. That looks really impressive, I will need to give this a try as I've yet to find the perfect under eye concealer! I am on my second pot of Erase Paste, I absolutely love it... even though it has been taking a back seat to my Touche Eclat lately. I'm not sure if you have the Real Techniques Core collection set, but I find the two smallest brushes amazing to apply this concealer. Its expensive, but it will last you ages!! eeeeek i want this now! looks like a real life saver, love your blog! This concealer has been in my head for ages!! But he price tag makes me hesited ... have you ever tried the Make Up Forever Full Cover Concealer? I'm actually hesitating between the two for my next concealer. please tell me you have eyelash extensions in?? if not, this is utterly unfair. Not sure if you can contact blogspot or if you are bothered about having it taken down, but wanted to let you know either way. Your review is great btw!